CHEW ON THIS. Let's be real about how mesh feeders can be a real mess and difficult to clean. 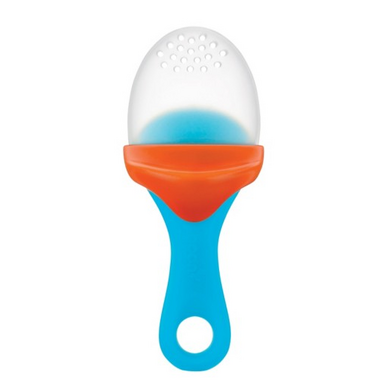 This silicone teething feeder has some bite to it; allowing for easy feeding with its interior firm stem that forces food out where babies can get to it. It's simple to clean and more durable than mesh feeders. Boon totally has a handle on baby's snack time and when something is this good, they think it's okay to get a little mouthy about it. Dimensions: 4.9" x 1.9" x 1.5"
Love this! It's so easy to fill and clean compared to the mesh styles. My little one loves fresh and frozen fruit and vegetables in his feeder. It's easy for him (8months) to hold and fits in his mouth perfectly! Easy to use, fill up and clean (which is it's huge advantage over similar products). Love them way better then the mesh, so easy to clean and my little guy loves them! Easy to use, easy to clean, and babe loves it! When my 8 month old is teething I put a piece of frozen mango in it and she loves it. I tried using it with pureed food as a self feeder but I found it too messy. I think I will stick to using it with frozen foods when teething. Haven't used it yet as it's an Xmas gift for my son but I am giving it 5 stars as it came fast in the mail and it looks to be really good quality. I'm a fan of the concept , that I can put fresh or frozen fruits in it. I was also recommended this product by the nurse at my doctors office , she said as my son is stil you for food I could put an ice cube to help with his teething. We can't wait to try it! Easy to clean, but a little big for our baby's mouth (5 months). LO has difficulty bitting it. This product has made the transition to solid foods so much easier with my second. Not only is he enjoying trying new foods but his teething needs are being addressed as well! It is so much easier to clean than the mesh one but my LO has more difficulty bitting it and doesn't like it much so we always go back to the mesh one. Super user friendly. Easy to clean and dry. I've put frozen and non frozen purees in there and baby loves it. He's 8 months so still needs some help using this, but I think overall the handle has good grip and is easy to use. Highly recommend this! I used to use the net ones similar to this however this one washes so much better. Babies are also able to hold it and it remains upright for them to chew on with ease!